Ok so last time we covered the basics of actors and the actor system (actor fabric) and covered how to send simple messages to actors. This time we will talk about actor hierarchies (supervision) and also actor lifecycles. But before we get into supervision and how it is used, we should just take a trip back to the introduction article in this series of posts. What does that actually mean. Well quite simply Akka embraces failure and treats it as an expected part of what could happen. Doesn’t this sound quite dangerous? Well yes and no, the yes part could be that an actor was part way through processing some message. So logic would dictate that you should ensure that you messages are idempotent, and are safe to send again. Luckily this is Akka’s bread and butter, it has a strong concept of ownership/supervision where the supervisor would know about an underlings failure and would know how to remedy that. We will look at this next. So far we have seen how to create our own little Akka systems. But what is really going on when we do that. 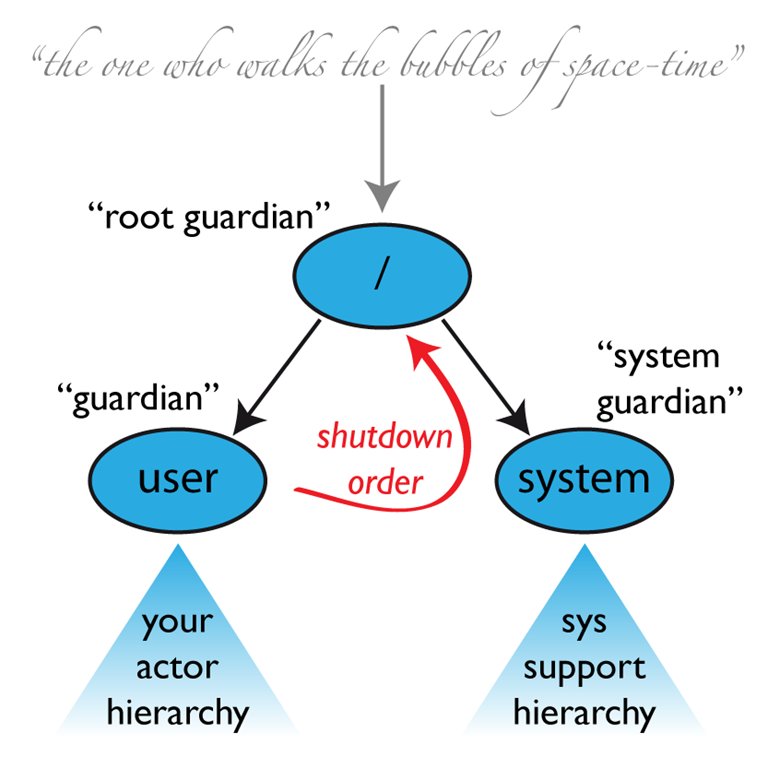 It turns out that the Akka fabric creates some top level Actors called “Guardians” which all user created guardians are “supervised” by. There are 2 sub guardians under the root guardian. The actor which is probably most interacted with is the parent of all user-created actors, the guardian named “/user”. Actors created using system.actorOf() are children of this actor. This means that when this guardian terminates, all normal actors in the system will be shutdown, too. It also means that this guardian’s supervisor strategy determines how the top-level normal actors are supervised. Since Akka 2.1 it is possible to configure this using the setting akka.actor.guardian-supervisor-strategy, which takes the fully-qualified class-name of a SupervisorStrategyConfigurator. When the guardian escalates a failure, the root guardian’s response will be to terminate the guardian, which in effect will shut down the whole actor system. Ok, so now we have established that there are top level guardians that take care of “supervising” any actors that are created programmatically, and that there is a guardian to monitor existing actors and log/manage their correct shutdown. But can we created our own supervisors? Well yes you can, in fact this is completely encouraged and a very very natural part of writing Akka code. As stated above it is completely possible to create our own supervisors. There are only a couple of things that we need to look at before we dive into looking at some example code. So what we are really saying when we talk about a decider is that it is a way for a supervisor to know what action to carry out when it sees a given Throwable (exception). This action will be applied to one (or more) of the supervsiors child(ren) depending on the type of supervision strategy used. Akka actually comes with a default decider, which you can use directly should you want to, or you can create your own which you can augment with the default Akka one. In this post I will create my own and augment it with the default Akka one. Let’s see an example of how a supervisor might use a decider and how it may create a supervision strategy. Here is the code for the “OneForOne” supervisor actor. There are a couple of things to not here. When we run this one, we will fail a particular child, and ONLY that child will be effected by the supervision strategy thanks to the use of the “OneForOneStrategy”. Here is the code for the “AllForOne” supervisor actor. When we run this one, we will fail a particular child, and ALL children will be effected by the supervision strategy thanks to the use of the “AllForOneStrategy”. adjusted with configuration settings ‘akka.log-dead-letters’ and ‘akka.log-dead-letters-during-shutdown’. 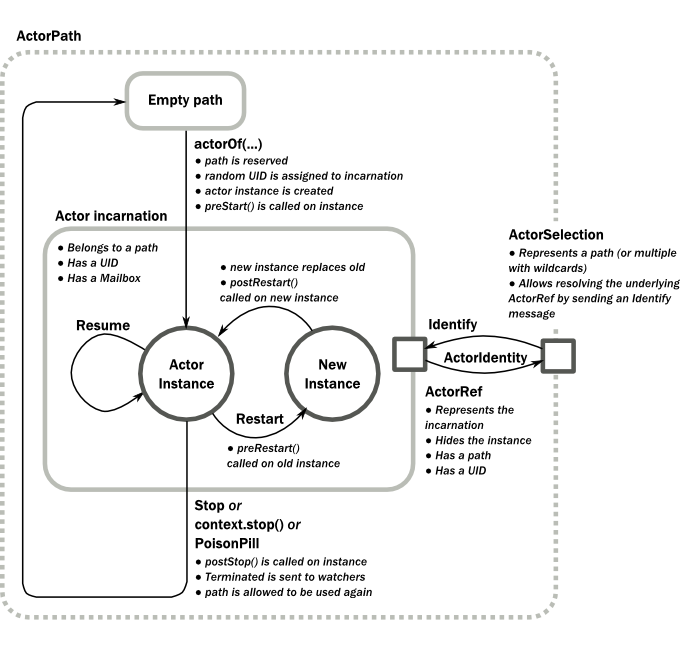 There is no better way of understanding the Actor life cycles that Akka has then to examine this image taken from the Akka documentation. The Akka documentation is actually very very good, its just there is a lot of it, and I am hoping this series of posts will be a bit lighter to digest, and shall concentrate on the most common parts of Akka usage. The official docs are obviously the place to go should you have a need for some deep Akka related question. This diagram is ace if you ask me, from here you can see exactly what happens when, and the different states, and what is available within each state. There is not much more I can add to that diagram, we can however take some of the concepts in this diagram for a little spin. As you can see you have all the pertinent information that you would need to make logic decisions on within the Actor. So last time I outlined the road map for this series of articles on Akka, and posted up some information from the Akka creators on what they had to say about Akka. This time we will look at a simple example of Akka. But just before we do that, let’s talk a bit more about WHY I think Akka is great stuff. This is all good stuff, and has got better to work with over the years, but there could be better more elegant lock free way of working with concurrent/parallel programming. For me this is what Akka brings to the table. Instead of working with shared state that MUST be protected when writing multithreaded code, we simply don’t use any shared state and create dedicated micro sized bits of code that deal with one thing and one thing only. These are called “Actors”. Actors do NOT share state instead they work independently of each other and rely on message passing. Where the message payload should give the actor either everything it needs to do it’s job (or at the very least enough information to perhaps look things up, say an Id such that Actor can look up the entity required by its Id field). At no point will we be using locks within actors. Ok so that is my mini-rant/intro over. Lets now carry on and have a look at what it takes to write some Akka code in Scala. What Libs Do We Need? As I mentioned in the introduction post I will be using Scala exclusively to do this series of posts. As such I shall also be using SBT to do the build side of things. NOTE : This SBT set of dependencies may grow in subsequent articles, but where it does require pulling in more Akka JARs I will show that when the time comes. How Do We Create An Actor System? Note that you should ensure that the Akka system is also shutdown correctly. The example I show here is a simple console type application, so my startup/shutdown logic is all in the same file, but in a real production app, things may be more complex (well they should be I would hope). How Do We Create An Actor? Now that we have an actor system, the next thing we need to do is create some actors that will live within the actor system. I used the word live as a ownership type of arrangement. So how do we create an actor exactly? Well luckily this to is dead simple we just need to inherit from Actor and provide an implementation for the receive method to handle the different messages that may be sent to the actor. Recall that an actor works by receiving messages and acting upon them. Just before we get on to seeing the examples, lets just take a brief diversion where we talk about the difference between ask and tell. When we ask (? method in scala) an actor we expect a response by way of a Future[T], this is an asynchronous operation. When we tell (! method in scala) an actor something this is analogous to fire and forget (of course the receiving actor could send a response back to the initiating actor via a different message, but that’s a different story), this is an asynchronous operation that returns immediately. We have not covered this ground yet but we will in one of the subsequent posts, but for now all you need to know is that when you are sending messages to an actor, you do so by a construct called actorRef which is a kind of like a handle to an actor. There are special types of actorRef one such case being “sender” who is the initiator actorRef of the message being received (if we are talking from the context of the receiving actor). You will see “sender” used in the examples below. How Do We Send A Message To An Actor? Here is how we would send a message to an actor. This is a tell (!) so is fire and forget. helloActor ! "tis a fine day for Akka"
How Do We Wait For A Response From An Actor?